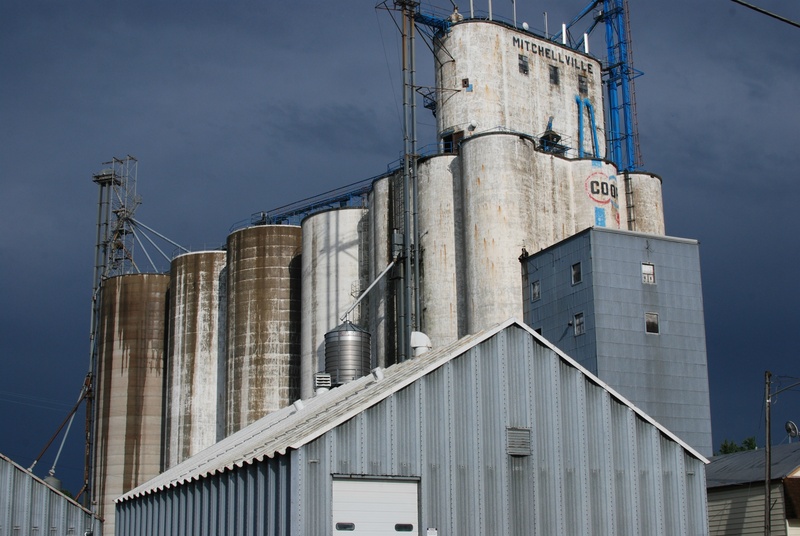 The Heartland Cooperative elevator complex at Mitchellville, Iowa. The Mitchellville elevator is visible from Interstate 80, and the rounded head house drew my attention as we headed through Iowa on our way home from our recent trip out West. “Just one more stop, OK, kids?” I said, and they answered with groans. I think I promised ice cream to quell the protest. 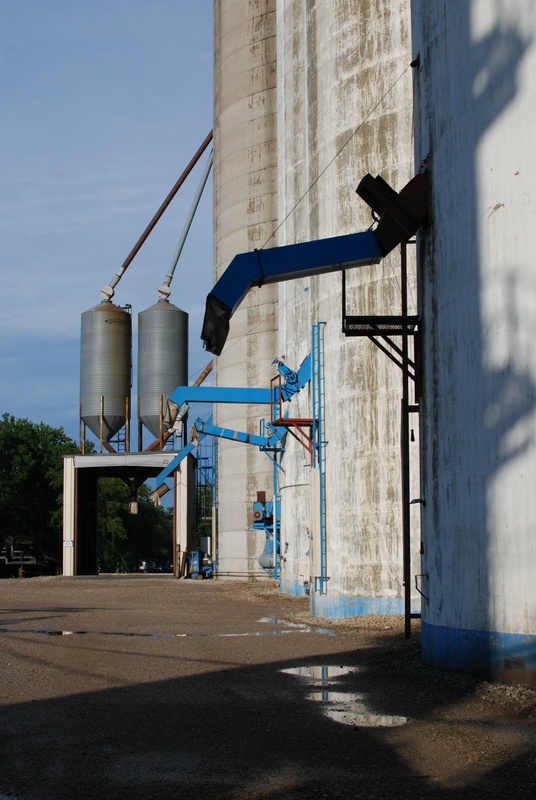 The main elevator built by Tillotson Contruction Company of Omaha, with grain drier. I parked the van, air conditioner running, in a shady spot and hopped out with my camera. Thunderheads threatened nearby, but the storm seemed to be moving off, and the sun peeked out and illuminated the scene. I took advantage of the beautiful light to photograph the elevator. As I finished up, I saw a truck rounding the corner from an alley into the gravel lot beside the elevator, so I flagged the driver down to ask if he knew anything about it. We were in luck. The driver introduced himself as Ed Baldwin, a grain truck driver for Webb Farms. He was more than happy to talk about the elevator, having trucked “at least two million bushels” in and out of Michellville. Bill and Stan Webb own the farm, and Ed purchased his truck from their father who used to truck his own grain. Ed gave me a quick outside tour of the elevator property. The Younglove annex viewed from the driveway. Ed explained the Heartland Cooperative operation at Mitchellville. He did not know the builder of the “head house,” as he termed the main elevator, but he knew the adjacent annex was built by Younglove in 1972. The bins had numbers and he pointed out the function of each one. All the way to the left was a new bin with its own leg that was built in the 1980s and used for damaged corn. Immediately to the right of it, on one end of the Younglove annex, was a bin dedicated to soybeans. 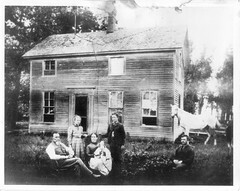 The rest of the annex held corn, with the main house taking all the wet corn since it gave access to the grain drier. 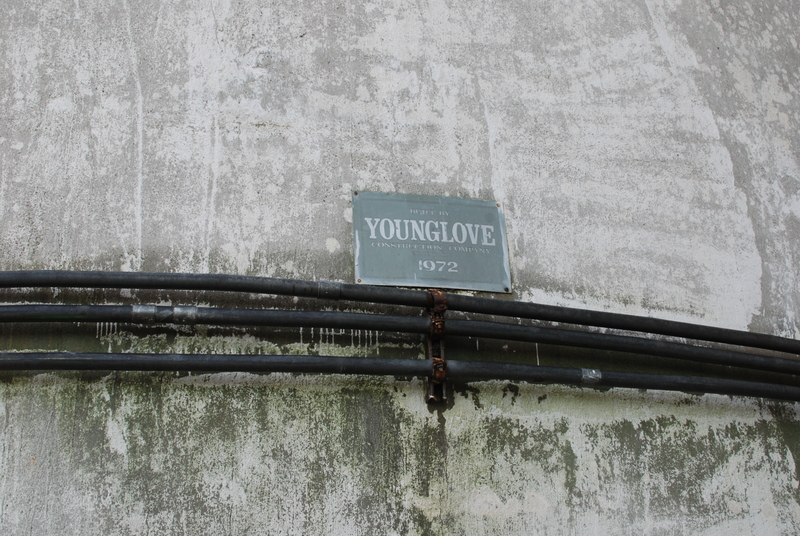 The Younglove annex is placarded with the date of construction. During harvest, the employees kept a grueling schedule filling the bins, especially during a wet year. Jim Dietrich, grain manager for Heartland Co-op at Mitchellville, would pull a twenty-four hour shift to accept the grain into the main elevator and dry it. The drier had a capacity of seven thousand bushels per hour, which would limit the amount of grain that could be taken in. Ed said the main house would take seven semi loads per hour of grain that needed to be dried. Shipments from the elevator were by rail, unless capacity was reached and grain needed to be trucked. Trucking would be the exception for Mitchellville’s operation. 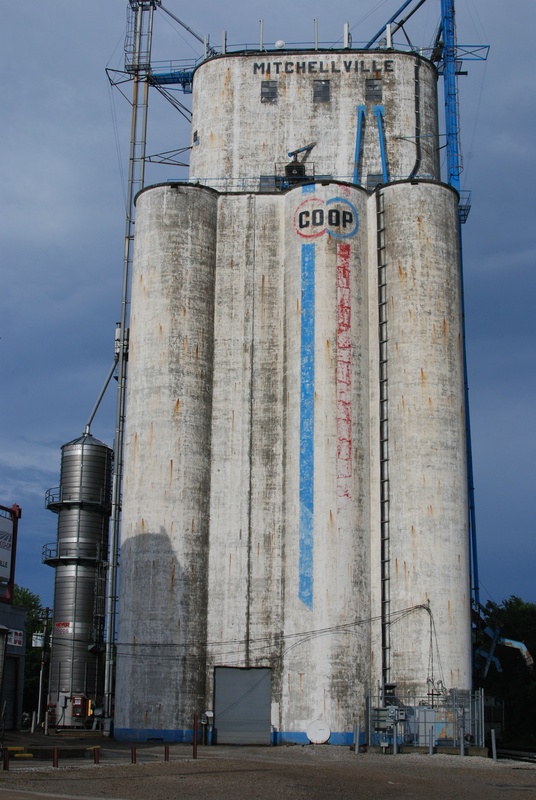 This entry was posted in Reginald Oscar Tillotson, Their Work, Tillotson Construction Company and tagged architecture, Business, grain elevator, grain storage, Heartland Cooperative, Mitchellville Iowa, photography, railroad, Reginald O. Tillotson, slip-formed concrete, soy beans, Tillotson Construction, Younglove Construction Company. I worked for a short while during the summer on the Younglove annex elevator(s). I was a student at Iowa State and drove the hour to work and back each night for the 7pm – 7am shift. I remember it rained at least one of those nights, and another time the cement truck broke down while making its delivery so I think they had to roughen up the drying concrete before we were again able to continue pouring after a truck finally arrived. Each day the elevator (and hence our climb up the ladder) was taller and taller. One of my jobs was to use a long rubber electric vibrating tool that helped mix the air bubbles out of the concrete after it was poured. We tried not to think about the fact that we were working on a wooden platform that rested on nothing, held up only by jacks! I was not too happy that Younglove took the cost of our hardhats out of our paychecks, as I think we only made about $2.40/hour. After a couple days on the job, all I wanted to do after I got home was go to sleep so I\’d be ready to get up at 5 in the evening to drive back for the next day\’s work. Thanks, Eric, for this reminiscence.